In January, the Arizona Legislature went back to work with roughly $1 billion in extra cash: $900 million in one-time funds, $200 million in the structural budget, and ~$150 million if Arizona complies with the federal tax changes. This was in sharp contrast to the past decade when many Legislative sessions faced multi-million-dollar budget cuts due to revenue shortfalls. One of Red for Ed’s goals was to restore K-12 funding to 2008 levels– before the massive cuts under Governor Jan Brewer and Senate President Russell Pearce. There are many programs and services that deserve to be brought back to 2008 levels– before we allow the Republicans to give more of your taxes away. For example, funding has not been restored to K-12 education, universities, community colleges, infrastructure, Department of Public Safety, Department of Environmental Quality, childcare subsidies, Temporary Assistance to Needy Families (TANF, AKA cash assistance to the poor), and care for vulnerable populations (like the developmentally disabled and the seriously mentally ill), to name a few. Three months into the 54th session, how are these spending talks going? Who knows? The Democrats are not invited. Although the Legislature is 48 Republicans to 42 Democrats, the Republican leadership is ignoring the 47% of the Arizona electorate who voted for Democratic representation. They’re living in the Brewer-Pearce glory days of austerity for the 99% and largesse for the 1%. House Speaker Rusty Bowers and Senate President Karen Fann are the Mitch McConnell’s of Arizona; they refuse to pass– or even hear— bills that would pass the Legislature with a majority of Democratic votes (plus a few reasonable Republicans). This is political gamesmanship; they are ignoring the needs of the state and ignoring the will of the voters. According to the Yellow Sheet, a subscription gossip column produced by the Capitol Times, in order to mend the tax conformity rift between the governor and Legislative Republicans, Ducey’s staff has been meeting with Senator J.D. Mesnard and Rep. Ben Toma (who led the revenue neutral charge to give away the tax conformity funds) and Republican leadership. Early in the session, Mesnard and Toma proposed mirror bills to make tax conformity revenue neutral. In other words, instead of investing the $150 million, their bills cut taxes in order to eliminate the revenue. (They want a return to austerity and privatization.) 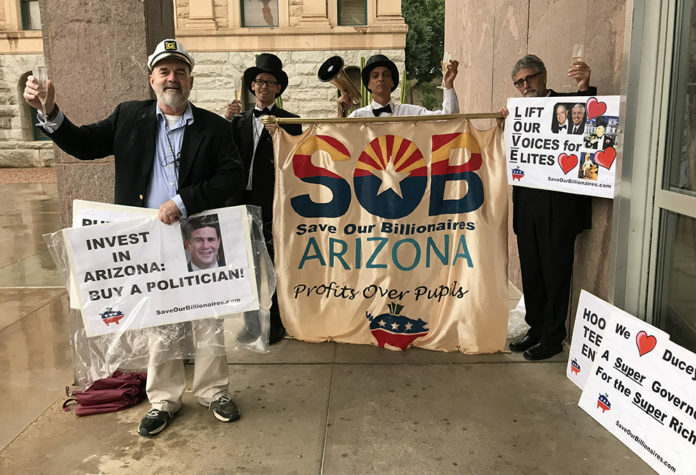 SB1143 passed on a party line vote but was immediately vetoed by Governor Doug Ducey, who said in his state of the state address that he favored full tax conformity and wanted to put that money into the budget discussion. Democrats in both houses agree with the governor on full tax conformity, although we may disagree on exactly where the money should be invested and how it should be split up. It is unconscionable that the Republicans would drag the tax conformity discussion out until June, as is suggested by the Yellow Sheet post (inserted below). The state of Arizona has passed full tax conformity every year for decades. The Legislature could have passed tax conformity in 2018– instead of running out the clock up to April 15 tax filing deadline. Why didn’t we accept full tax conformity a year ago? Because Republicans don’t want the revenue. They would rather privatize the schools than fully fund education. Their goal is to drown the government in a bath tub. Their ideology preaches privatization to make a buck– instead of investment in programs and services that help the people. It’s time to end the Republicans’ backroom deals and get this done– with the full Legislature having a voice– not just 48% of the Legislature. This is the last week to hear bills in committee; the budget battle begins in earnest after that. Is tax reform also looming? Below, the Yellow Sheet report reports: “Mesnard said the group is broadly discussing two approaches: a ‘simple’ offset of any revenue windfall from tax conformity, and a larger discussion about tax reform.” I’m all for reforming the tax code, but I don’t want the Republican foxes guarding– or redesigning– the hen house. Republican Legislatures have passed billions of dollars in tax giveaways, tax cuts, tax credits, and individual sweetheart deals for specific corporations. Arizona’s budget is volatile because it depends far too heavily on sales tax. When recession hits, people get laid off, they spend less money, and state revenue plummets. The state’s financial system is made up of a hodge-podge of bills that rely too heavily on regressive taxes and tax giveaways. Any discussions about the budget or tax reform must include the other 43% of the Legislature– the Democrats– and their constituents. The tax conformity group – which is made up of Toma, Mesnard, the majority leaders of both chambers, and the governor’s staffers – plans to meet early next week. The group, in fact, has been meeting about once a week, but Mesnard said they’re still “in the brainstorming phase.” Mesnard said the group is broadly discussing two approaches: a “simple” offset of any revenue windfall from tax conformity, and a larger discussion about tax reform. As noted last month, the governor’s office offered a three-pronged deal to resolve the issue: Arizona would conform to the federal tax changes for tax year 2018 and use the revenue windfall to pay down what’s called the Series B debt. Arizona would then conform to the federal tax changes and then permanently increase the standard deduction from $5,000 to $7,000 in tax year 2019 and beyond, and finally, the state would deposit $540 million in the rainy day fund. “FY18 is up in the air, and FY19 is up in the air,” Mesnard said of the talks. He said it is plausible the two sides could come to an agreement on tax conformity by end of April, but the more tied to the budget the issue gets, the more complex the discussion and resolution will be. “It could also take into June,” he said. Next articleNew Maricopa County Democratic Party Executive Director Maritza Miranda Saenz discusses Preparing for 2020. Republican leaders Rusty Bowers, JD Mesnard and others are in gross violation of their oath of office to be “impartial” in the execution of their duties. They are highly partisan and openly work to suppress the voices of Democrats. They are waging class warfare upon the working families of Arizona.